Play in your web browser. Play through iTunes on your computer. Subscribe with iTunes or Podcasts app on your iPhone, iPad, or iPod touch. Subscribe using a podcast app on your Android phone or tablet. To subscribe or listen in iTunes, visit the Subscribe page and click or tap on the “on iTunes” button. Your computer should open iTunes, where you will be able to listen or subscribe to the podcast. If you have an iPhone, iPad, or iPod touch, tapping the “on iTunes” button should open either the iTunes app or the Podcasts app. Here, you can listen to episodes online, download episodes for later listening, or subscribe so that new episodes will be automatically downloaded. To listen or subscribe to The Recovery Show on an Android phone or tablet, visit the Subscribe page and tap on the “on Android” button. If you already have a podcast app on your Android device, it should automatically subscribe you to the podcast using your app. If not, it will take you to a page with some suggested podcast apps. I did this recently on my LG tablet so I could give you step by step instructions. Stitcher is an award-winning, free mobile app that lets you listen to all your favorite shows, plus discover the best of news, entertainment, and sports on demand. Listen to whatever you want, whenever you want, with one free app. With Stitcher, there’s no downloading, no syncing, and no wasted memory. 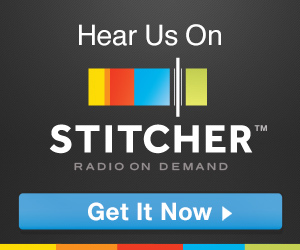 Stitcher is available for iPhone, iPad, Android phones and tablets, Kindle Fire, Blackberry, and on your desktop. You can link to your Facebook account and comment on the shows you listen to.